TAJ = Tourmaline + Amethyst + Jade. Designed to use at home on your seat or chair, but you can set it flat to lay on it. You can buy a 12V/11V converter and use it in a car. The back part is 20” x 18” and the bottom is 18” x 18” and can easily fold. Because the mat is held in place with mesh so you wouldn’t have to worry about any new product smell. Use it on the floor or on top of your bed. Mats with the PEMF feature have an added layer that reduces flexibility. Mats bend easily at predetermined positions. Although you can bend a mat at any position, it is not advised to try to create your own shape out of it because doing so may affect the appearance and longevity of the mat. HealthyLine mats incorporate a few different systems that reach the common goal of improved health. 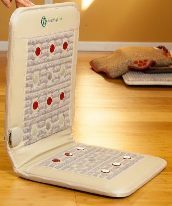 Each HealthyLine mat provides negative ions, far infrared rays, and heated gemstones. The gemstones naturally emit negative ions and far infrared, and when heated the stones become activated and provide benefits at a greater level. This is made possible with many functional layers. Essentially, a wire that heats up goes through the mat. That wire is lined with silicon coating that filters bad EMFs from the mat. Additional layers help with heat distribution so the mat heats up evenly all throughout. The bottom layer is a waterproof material, while the top layer is high-quality synthetic leather. PEMF or pulsed electromagnetic field therapy is a process of applying magnetic fields to the body. It is used to help with joint repair, blood circulation, and brain function. Frequencies between 0 Hz to 100 Hz (Hz is a measure of cycles per minute) have been found to be beneficial. HealthyLine uses a frequency of 7.8 Hz which is the same frequency as the earth’s magnetic field which also helps to reverse the effects of harmful EMFs cause by electronic waves such as radio towers and cellular data. The PEMF function operates at cycles of 20 minutes powered followed by 100 minutes turned off: this cycle has shown to be most effective. At 3 gauss the magnetic field has the same strength from the surface of that mat up to 3 feet above it, so it will reach your entire body. Photon light therapy uses near infrared light. LEDs stimulate cell growth throughout the body. To be effective the photon lights have to make direct contact with your skin. This is an optional feature and can be turned on/off with a button. For a sauna effect, use the mat at 60-70C for about 30 minutes, while covered with a blanket. For overnight use set it to about 45-55C, according to your comfort. It is suggested to place a towel on the mat, instead of lying on the stones directly, to protect the mat from sweat. Human body temperature is approximately 38 degrees Celsius so that would be an ideal point to start. Gradually increase the temperature to test your tolerance. Set your temperature lower for longer usage and higher for shorter periods. Always drink lots of water before, during, and after use to prevent physical effects of dehydration. Safe for pets and children. PEMF can be used while mat is heated. Photon lights must make direct contact with skin to be effective.